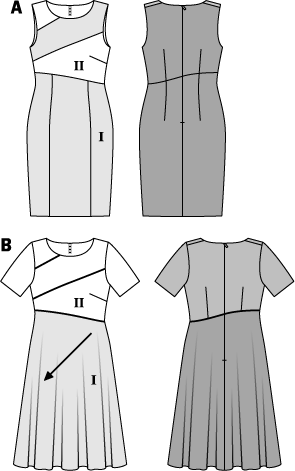 Burda 6756: Narrow shift dress with skirt variations and bias cut insert for contrasting. Version A had been cut for some time, pulled out, stared at and put back repeatedly. I just couldn't find the right fabrics to pair with it ... until recently. Scored a few pieces of fabric from Fulton Fabrics and bingo, while paying for the fabrics, knew what pattern would work. 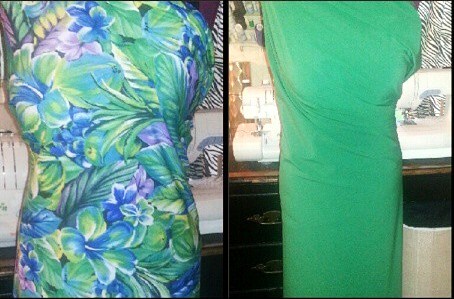 For the body I used a kelly green stretch cotton and for the insert a cotton knit floral print. Without further thought, plowed through the construction, which was seamless. Although I wasn't too crazy about the shoulder yoke piece... it was just one of those things wherein I was like... why a separate piece for one shoulder as opposed to separate pieces for both shoulders. Also, the diagonal back waist seam is odd, but kept it moving. The only portion that was basted were the side seams, everything else was stitched and hitched. Tried the dress on and it was snug, of course, expletives followed. WTH, I had two options, the dress could remain a valet dress, only worn for just a few hours with underoo armour on ... or ... add a smidgen of ease and it would be perfect for work & 12 hour wear and no need for underoo armour.. just my regular underoos. Normally, I baste my dress together, but as I'd mentioned, plowed through this construction. So I spliced those side seams open and added side seam gussets and smaller seam allowances, which added just enough ease to wear my regular underoos and fully lined. A lesson was learned...and immediately made another one which I will save for another post. Hoping Everyone had an Awesome July 4th and have a Great Week. I loved this on Instagram, and am happy that you were able to save it! Can't wait to see the next one! I'm so living vicariously through you know...I miss dresses! Side seam gussets are certainly MY friends:)). What a beautiful dress on you! Glad you were able to save it, as it's a beautiful dress. I love your fabric combination. Werk it out Sheila! This turned out beautifully! Thank You Edube. Gussets are definitely garment savers. Lovely dress! Looks great on you. I cannot see your gussets, obviously they work as I said this looks great on you. I now have to try this pattern. Thank you Linda. The side gusset strips are 1/2" and the smaller seam allowances added just enough ease. You will enjoy sewing this. The skirt has 3 front panels and there is the back with a seam. All the pieces matched up perfectly. However, did tweak the shoulder yoke & neckline on my 2nd version. Haha - underoo armor - I HATE wearing Spanx! This looks great - yay for the save!